Fresh or Frozen -- Won't Stick With Our Premium Products! 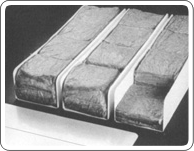 SCHWAB IS THE INVENTOR OF THE "FREES-IT" LAYER BOARD DEVELOPED IN THE 1950'S. stickiest product. If you are Flash Freezing, no problem. Also available is our "Econo" Layer Board. already Frozen. Both USDA approved layerboards are converted in our Romeoville, IL plant. They are available in thicknesses from .010" - .026" and cut to your exact size. Pre-assembled and knocked down partitions with FDA approved wax coatings provide the ultimate in convenience and economy; store in small space, pop open and insert into cartons. 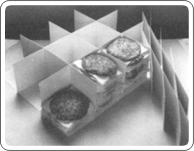 Developed by Schwab in 1987 as a Hamburger Patty carrier tray for Wendy's® International it can be custom sized to fit your needs. Copyright © 2008-2013 Schwab Paper Products Co.